The tech world and the ebook aficionados have been buzzing with speculations on the upcoming new 8th-generation Kindle that was announced by Jeff Bezos himself last week. The Digital Reader, Teleread and the eBook Reader all have great articles on both the speculation and the rumors about the new device, including the name. There are also a number of threads on Mobileread, KBoards and the Kindle forums discussing the new new device’s potential features. 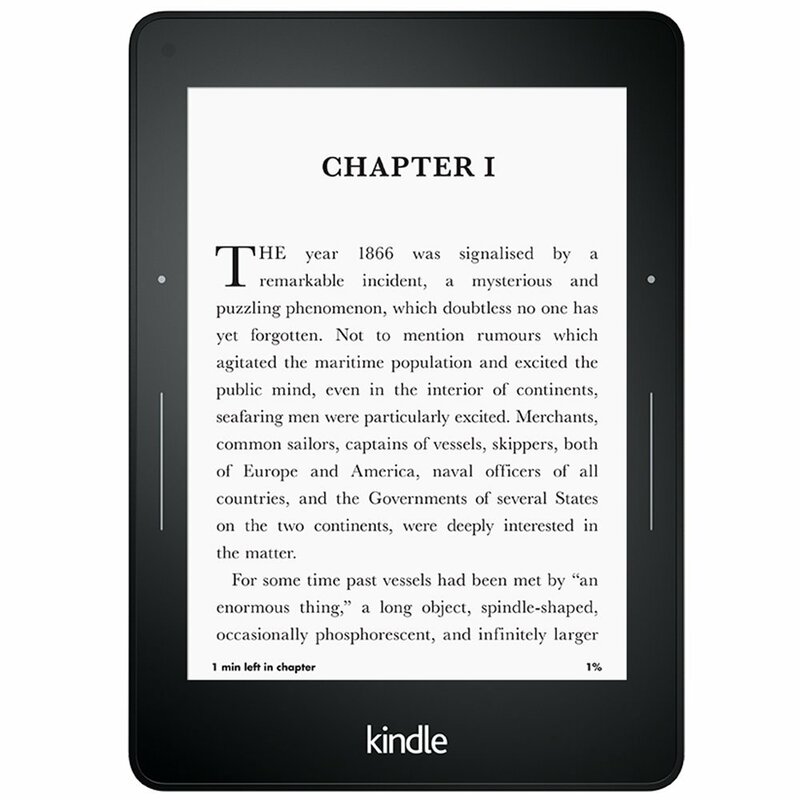 Kindle or Tablet: Since Jeff Bezos said that this was going to be the eighth generation, most people assume that this device will be either an e-ink Kindle or possibly have a Liquavista color screen. Screen size: The screen size for the device is unknown. Name: Kindle Oasis – According to Mobileread, a page spotted on Amazon Japan (no longer available) indicates that the device will be called the Oasis. Now, there’s a lot of speculation as to what exactly that name refers to. Some are suggesting that it means the new device will have be waterproof. Others are suggesting that it implies a Liquavista color screen. Features: There’s been a lot of discussion on possible features for the new Kindle. There has also been some talk about a new basic Kindle. This would not be the first time Amazon has introduced more than one new product at a time. Bezos indicated the new Kindle will be “top of the line,” a position the Kindle Voyage now inhabits. Since the new device is apparently not called the Voyage 2, we can only assume the new model will add a number of new features. Better front lighting – Some of the early Voyage e-readers had problems with the front lighting and from what I read on the forums, some people are still not happy with the way the device looks now. Waterproof – Since Barnes & Noble and Kobo both have waterproof readers, some think that this is a natural next step for a new Kindle feature. Page Turn Buttons – Not everyone is totally happy with the haptic feedback on the Kindle Voyage. There’s still a call for device with dedicated physical buttons for turning pages. Bluetooth – Initially, Bluetooth seemed an odd feature to add in an e-ink type of Kindle. However, a Bluetooth keyboard could be paired with the device for easier notetaking. Bluetooth would also allow for the use of a hands-free page turning feature. Text to speech – The Kindle keyboard was the last Kindle with text to speech functionality. While all the Fire tablets are capable of text to speech, it’s one of the most requested features to be brought back to the Kindle line. Battery Case: I have seen iterations of ideas on these cases: Some ideas suggest a thinner Kindle with the battery in the case. Others suggest speakers and Bluetooth integration in the case for either text to speech or audio book use. Still others are suggesting a solar powered case coming in the near future. I will definitely buy the latest Kindle that comes out. In the meantime, Amazon has slashed prices on its current lineup of e-ink Kindles and some of the Fire Tablets. Are they clearing out inventory to make way for the new models? The continued price cuts on current models, particularly the seldom discounted Voyage, seem to be further fueling the speculation.